Blogging can be joyful but it can also be incredibly disheartening, frustrating and full of defeat (yes, i’ve mentioned this plenty of times before). I owe a lot of gratitude to the companies that have been kind enough to work with me, not because of a ROI but because they genuinely care about my opinion and the content I create. If you are a large corporation worth billions of dollars and you decide to run an “Autism at Work” program, employing autistic individuals and running seminars/talks with lots of press material and attendance, it’s in your very best interest to make sure that everyone is on the same page. 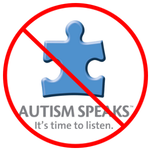 Your PR company should know better than to use the terminology “with autism”, they should also realize that if they are employing autistic individuals then that would be a perfect segue to attracting autistic customers. I got so wound up and so incredibly anxious after dealing with all this in the morning that I have felt unwell the entire day. I tend to internalize my feelings. Sometimes I think of our home, our planet as seen from space. It makes me realize how insignificant I truly am and helps puts things in to perspective.